SPX: Another very exciting week - so exciting that I don't even know what to tell you... Well, the most important thing was that the rally I expected didn't occur. Already on Tuesday I mentioned that my short term count might be incorrect. Two days later I got confirmation that the count was incorrect and the rally will be delayed. 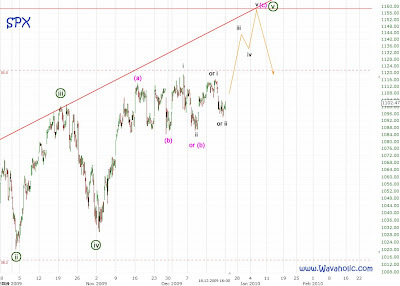 On Thursday when the markets were heading lower I changed my preferred count: The top of wave i/ is now at 1115 (Dec 14). From there the market corrected in a wave ii/. On Friday wave ii/ should have bottomed and wave iii/ started. That's supported by this fractal.